I wanted to make some baguettes today. I had some excess active firm starter. 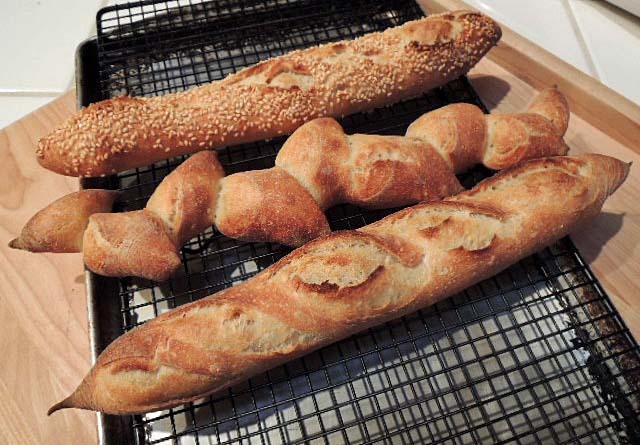 I usually make sourdough baguettes with a liquid starter, and my best sourdough baguettes take two to three days to make, but why not try a formula for one day baguettes with firm starter? To make 3 ficelles weighing 200 g apiece. And to use a bit of instant yeast to have the baguettes done before dinner time. Mix the firm levain and ferment for 12-14 hours at 70º F.
Mix the flour and water in the final dough to a shaggy mass and autolyse for 30 minutes. Add the salt, yeast and the firm levain is 12 pieces to the dough and mix thoroughly. Transfer to a clean, lightly oiled bowl and cover tightly. Divide into 3 equal pieces and pre-shape as balls or logs. Proof at 70º F for 45-60 minutes. Transfer the loaves to a peel and score as desired. Bake at 460º F with steam for 12 minutes then in a dry oven for another 8-10 minutes. Note: These are light and thin loaves. 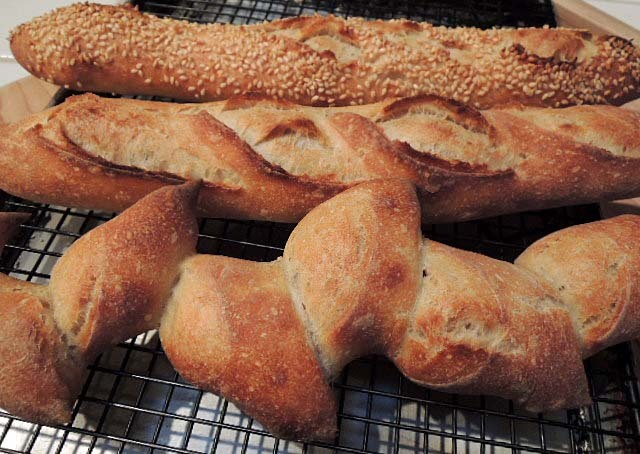 For larger baguettes, the baking time would need to be increased to a total of 22-25 minutes. If a lighter-colored crust is desired, the oven temperature should be decreased to 450º F.
Cool for 30 minutes (at least) before eating. I treated each of my three baguettes differently, as seen. 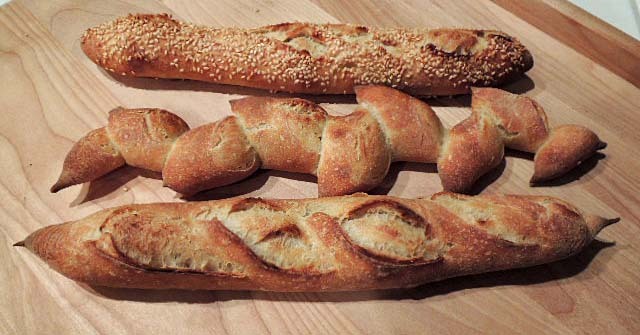 I made one into an epi de blé, one into a seeded baguette and one was made as a traditional baguette. The crust was crisp and the crumb was tender – just a bit chewy. The crumb structure was nice and open. The flavor was good, but not great. There was no perceptible sourdough tang and less sweet flavor and less complexity than I want in a baguette. I think this formula, with the added yeast, resulted in a short fermentation that did not allow for full flavor development. In addition, the levain I used had been taken from my refrigerated stock starter and only fed once. My judgement is that this formula is worth playing with. Next time, I will use a starter that has been fed at least twice and will omit the instant yeast. You proved that a one day baguette bake can be a good looker inside and out even if the SD tang is missing and the full flavoer is lacking. Better than not having baguettes for 2-3 days I say.